Liberty was retained by Greater Berks Development Fund to perform an environmental assessment of an 11-acre brownfield site under Pennsylvania’s Land Recycling Program (“Act 2”). The site covered comprises several former industrial properties, including Willson Safety Products (a safety goggle manufacturer), Stelwagon Lumber, an iron foundry, and a hosiery mill. The property is located in an Enterprise Zone, which enabled the site to be remediated under the Special Industrial Area (SIA) cleanup standard. A Phase I Environmental Site Assessment was performed and a Baseline Environmental Investigation Work Plan was submitted for Pennsylvania Department of Environmental Protection approval. Site assessment activities were then performed in the seven areas of concern that were identified on the site. The site assessment activities included a geophysical investigation utilizing electromagnetic and ground penetrating radar methods, installation of nine groundwater monitoring wells, groundwater sampling and groundwater contour mapping, advancement of numerous soil borings and collection of soil samples. Also, an asbestos survey was performed on all buildings, and PCB-containing equipment was sampled and quantified. Due to shallow bedrock and the discovery of free product on groundwater, a soil vapor investigation was performed in two of the areas of concern to determine if vapor intrusion into buildings presented a health threat to building occupants. A Baseline Environmental Report was prepared, proposing limited remedial measures to eliminate all immediate, direct or imminent threats to human health and the environment, as required under the SIA standard. Work at the site was coordinated with the owners of the former Willson Safety Products property, who were conducting their own separate Act 2 investigation. A Release of Liability was granted by PADEP, protecting the current and future owners from environmental liabilities associated with the site. 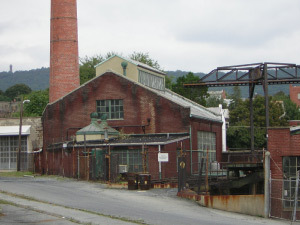 On August 21, 2004, Governor Ed Rendell announced that the Goggle Works project was approved for $3 million in state funds to convert the site into an arts center. “The Goggle Works Center for the Arts” officially opened on September 17, 2005, and includes a cafe, 40 artist studios, a film and performance theater, five galleries and a glass blowing center. In May 2015, a groundbreaking ceremony was held for the Goggleworks Apartments II, 28 artist apartments to occupy the remaining vacant warehouse space adjacent to the Center for the Arts.